Very pleasant and very organized. I asked about the chance of buying two right handed shoes, due to a Stroke my right foot drags wearing out the shoe. They said sorry but they only sell normal shoe pairs. FIRST RATE. EXCELLENT HELP. KEEP UP THE GOOD WORK. Didn't appreciate being called `SIR` when I got served by a worker with the initials L.L, when I'm a naturally born female and it was clear by looking and seeing me that I am a woman and not a man! 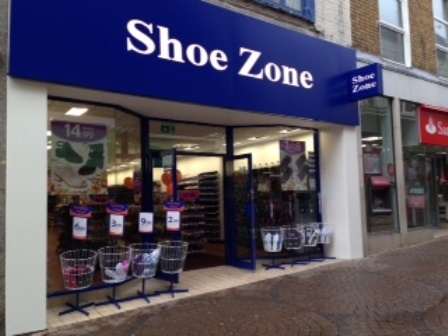 That has really upset me to the point that I don't really want to go back into shoe zone unless I really really have to. I don't normally cry over anything but being called `SIR` made me cry. Presides that, I didn't find all that I was after, I had no help from staff, the shoes are hard to find in a wider fit range but at least I found a pair of shoes for a Christening that I have to attend.